I got this email from Justin Stets late last night, asking me to post the info below. I’m a great singer, as my children will attest but I decided instead to take photos this morning when students from Bridgewater, Sibley, and Northfield High School were packing food. 5th Bridge is sponsoring the MobilePack unit of Feed My Starving Children in Northfield on Friday, November 11 and Saturday, November 12. Over the course of the two-day event, 5th Bridge aims to engage 1,300+ area residents in packing 350,000 meals for starving children around the globe and raising $84,000 to pay for the cost of the meals. 5th Bridge raised the meal total from 250,000 to 350,000 as FMSC identified the pressing and urgent need to send food to the continent of Africa. 5th Bridge has taken on that challenge and we are calling upon more volunteers to help achieve that goal and pack food for children whom you will never meet. This community has proven to be extraordinarily generous and we’re confident we’ll raise the funds necessary to pay for the meals. To date we’ve been successful at engaging a great range of participants. As an example, we’re expecting Sibley 5th graders and seniors from Millstream Commons on Friday morning. So, in short, this will an event that people of all ages will find rewarding. But we’re looking for more people power to pack meals. There are still a handful of openings for volunteers and we’d appreciate anything you can do to help spread the word. Friday, November 11 from 2:30 to 4:30 p.m.
Friday, November 11 from 5 to 7 p.m.
Saturday, November 12 from 8 to 10 a.m.
Saturday, November 12 from 3:30 to 5:30 p.m.
All sessions will take place at Perkins Specialized Transportation (1800 Riverview Drive). A complete schedule and online registration is available on the 5th Bridge FMSC page. Would you sing for Haiti with this guy? How about just listen to singing? Golf course architect Paul Miller (Paul Miller Design Inc) stopped by my morning office at GBM last week with the poster of Saturday’s Singing for Haiti fundraiser at The Grand Event Center. 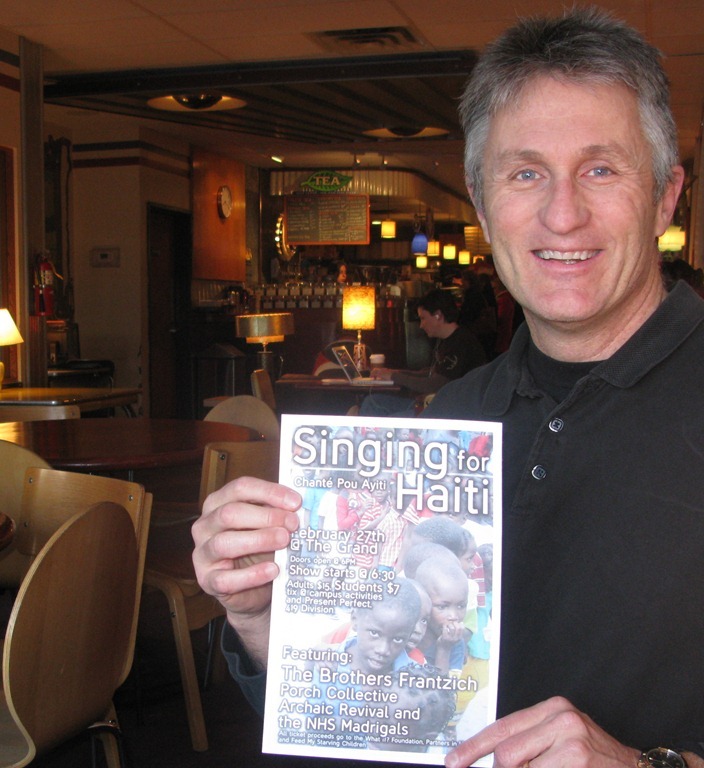 Paul has been involved in peace and justice work in Haiti for over a decade and is the founder of the Haiti Justice Alliance of Northfield which is hosting the event. Money raised will go to the What If? Foundation, Feed My Starving Children, and Partners in Health. Musical groups performing include The Brothers Frantzich, founders of Feed Them With Music; Carleton bluegrass band, Porch Collective; St. Olaf psychedelic/blues/jam band Archaic Revival; and Northfield High School‘s Madrigals. 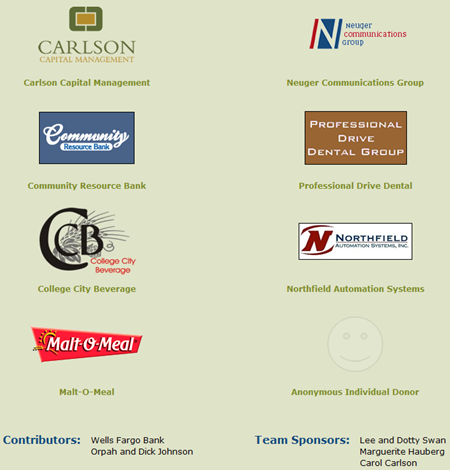 Local sponsors include Carleton College, St. Olaf College, Labor Arbitration Institute, Schmitz, Ophaug, and Dowd, LLP, Buzz Salon, and Paul Miller Design Inc.
For more info, see 1) Carleton College’s Haiti Relief Gateway; 2) last week’s Nfld News article, Concert to benefit Haitians; 3) Jane McWilliams’ blog post on Northfield.org. You can get tickets at Mary Rossing’s Present Perfect store on Division or at the door at the Grand on Saturday. Feed My Starving Children (FMSC) has been the focus of Northfield-based 5th Bridge. 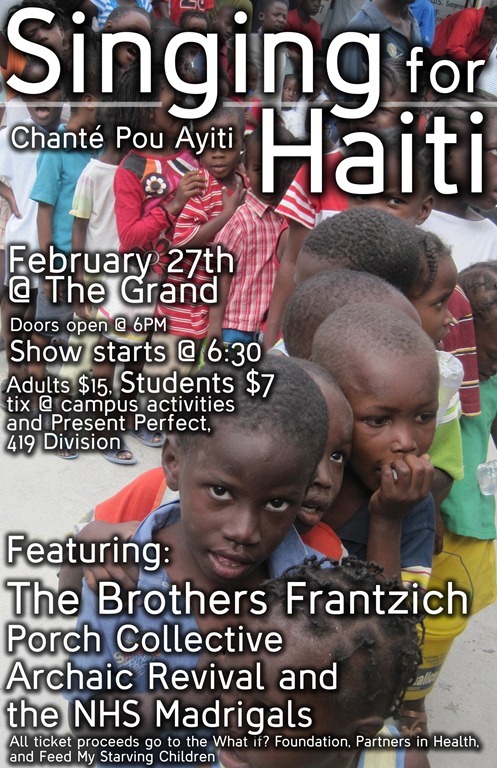 See the FMSC Haiti Earthquake Response page. The Northfield mobile packing event for Feed My Starving Children, which was hosted by 5th Bridge, this past weekend, was a fabulous success. 171,072 nutritious, life saving meals, were packed by 705 Northfield volunteers and over $26,000 was donated by individuals and businesses to cover the costs of the food we packed. Simply put, 468 starving children around the world will be fed for the next year, because of the caring and generosity of Northfield residents. Here’s an 8-minute video clip (taken on Saturday) from this weekend’s 5th Bridge/Feed My Starving Children event at the Armory. 5th Bridge has secured 800 Northfield-area volunteers to pack 150,000 meals and raise $22,500 for Feed My Starving Children this weekend. It all starts Friday at 11 am at the National Guard Armory and goes all day and all night through the weekend. See the press release (PDF) and the 5th Bridge FMSC page for details including who to contact if you’d like to volunteer.